Spam Blocking Service in the Cloud! Our Enterprise Level spam blocking service works for businesses large and small. Get ready to be spam free! 4 WEEK FREE TRIAL – NO OBLIGATION from the setup date of the account on our system. PLEASE NOTE: This service does not work with free accounts like gmail, yahoo, hotmail, etc. 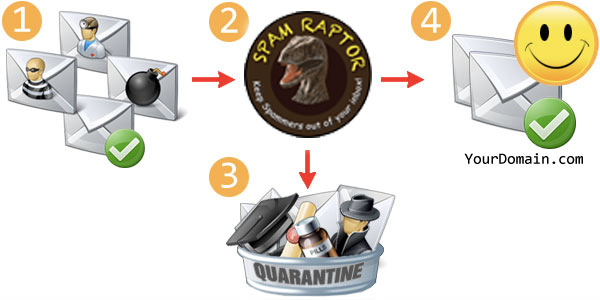 SpamRaptor stops spam before it reaches your inbox. It will be delivered to our mail servers and scanned. It will then either allow the email to come through or it will block the email. If it blocks the email and it is a valid sender, you simply login to the SpamRaptor Control Panel above then whitelist the sender. Then their email will be delivered thereafter. You can also view emails within the control panel for safety. This stops malware and viruses from reaching and activating on your computer. SpamRaptor uses a combination of computer and human interaction. In the event that some spam gets through to your inbox, simply forward that email to the email we provide and it will be blocked for you. Our system is automated. So signing up and entering your credit card triggers our system to start the process and makes it easier come billing time for the account. This also allows us to offer the discounted rates that you see on this website. Your credit card will only be billed after the trial if you decide to continue with the service. FREE 4 WEEK NO OBLIGATION FREE TRIAL! Simply signup below. We will ask you some questions then we do the rest. We will contact you for information we may need to setup the account. A simple change to your MX RECORDS (mail records) on your DNS (domain name system) and our system does the rest. Still have questions? Read our SpamRaptor FAQs here or Contact us here or CHAT with us, lower right.